If you aren’t having a crazy week, congratulations! You are luckier than me. But thank goodness I had a DIY to be a bit of stress buster. 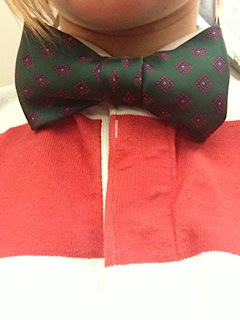 I have been obsessed with men’s neckwear for probably my entire life. I owned all those shirts from Limited Too back in the day where they came with the tie with a clasp, and I currently own tie and bow tie necklaces alike. (Dear boys that just happen to be reading this: skinny ties and bow ties make me swoon. Achille's heel right there.) 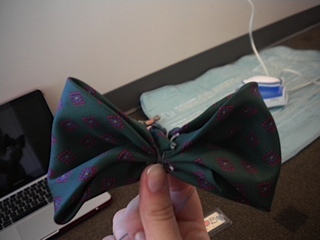 I have always wanted a bow tie but there comes the issue of not knowing how to tie one; nice ones are a bit too expensive for this broke college student and I can never find a cute one. But have no fear, Goodwill and crafty intuition are here! Thus, Glossers, this week’s DIY is making a bow tie out of an old tie. Start by deciding which of the four ties you want to use (okay, maybe I just bought four ties). 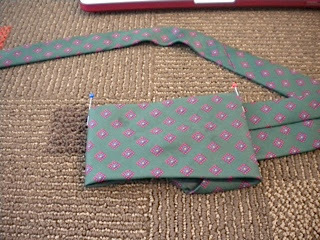 Lay it out and measure about 2 ½-3 inches horizontally from the big tip of the tie so that you have enough room to fold it under. 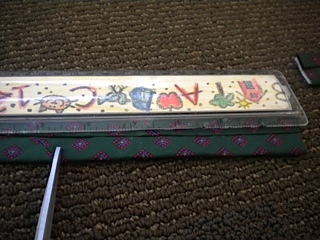 From that point, measure out 5 ½ inches and place a pin at either end of the 5 ½ inches so that you have markers for where you need to fold. 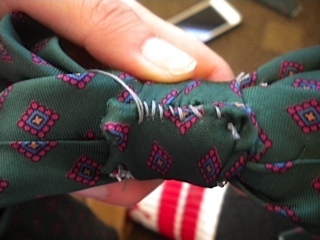 Fold the tie where the pins are, and make sure you fold the pieces underneath. 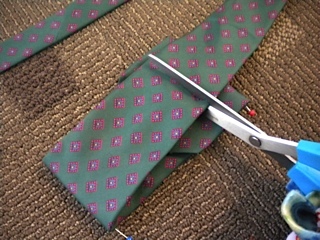 Now, take out your trusty shears and cut off the long, skinny excess part of the tie from where you folded. Whoa, hold up. Make sure you leave enough that overlaps and that you can fold ½-inch under to sew to the other part of the tie. Spoiler alert: Now you fold ½-inch of the raw edge under and sew that edge to the part that it overlaps. You should have a little loop. An iron might be helpful to get that little edge to stay down but sewing pins are also helpful friends. I mean, you should always try to pin stuff down when you are sewing it so that it doesn’t move and get all janky. Now, you may notice that in your loop a bit of the wider part of the tie is sticking up. 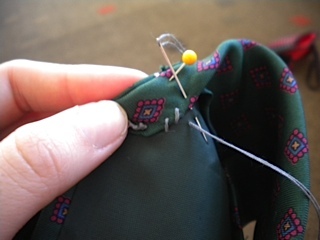 An easy fix is to fold this part down a bit so the loop is even and just sew that loop down. If you forget how to sew, as I said before, hit up Google and YouTube because that would be a little too hard for me to explain without jumping out of your computer and showing you. It is time to make the bow shape. Pinch the loop in the middle and scrunch it so the sides fan out. If this isn’t your first “Veronica DIY column rodeo,” you know I am talking about doing the same sort of thing that I did for the duct tape hair bow. The pictures of me pinching the center are almost identical. 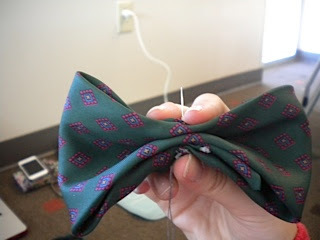 But for this one, you need to take your needle with knotted thread and thread it through the folds. 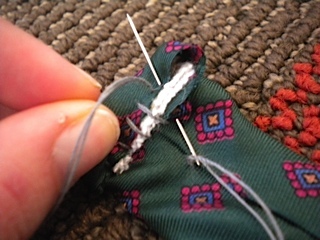 Then, tightly wind the thread around the center of the fold several times. Knot the thread in a similar way that you would after you finished hand sewing something. Once again, Google is your friend because my eloquence is not found in describing how to knot something with a needle and thread. Now, find the rest of the tie that you probably threw under all those textbooks that you are supposed to be studying. Wrap it around your neck to figure out how long you need it to be to make the neck strap. There should be enough to overlap over a collar. Cut it to that length. If the little pointy end seems a bit flared out from the rest of the skinny part, fold it slightly in and sew it down like you did with the flare up earlier. Lay your neck strap part down, right side up, and place the bow somewhere near the middle right side up (what is considered “right” is up to you for the bow). 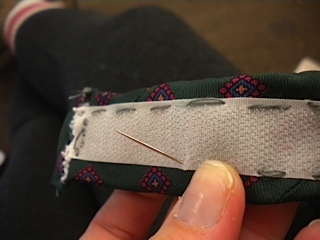 Take your trusty needle and thread and sew the bow to the neck strap part by sewing from the edge of the neck strap to the edge of the middle of the bow, where you wound the thread around. Do this on both edges of the neck strap. You may be jumping in your seated position with excitement because this is starting to look legit. 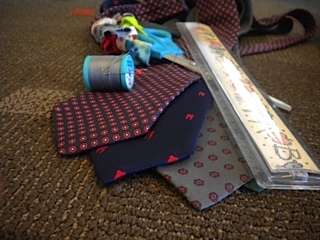 With the rest of the tie, make sure you have around 5 ½ inches to wrap around the center of the bow. Wrap it tightly around the bow and neck strap that are now connected. 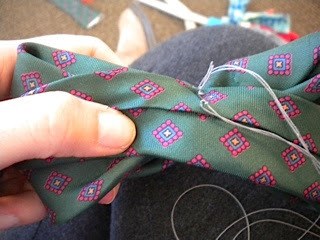 Sew down the first raw edge to the middle of the bow and wrap the rest around, overlapping the edge you sewed down. Fold under around ½-inch and sew that to the rest of the bow to complete the loop around the center of the bow. Don’t get too ahead of yourself because you have just a little bit to go before you can wrap this beauty around your neck. Look at the one end of your neck strap. It is sad and raw-edged. Fold that sucker under and sew it down. Once you are done dealing with that trouble maker, whip out that Velcro. You may need to re-wrap the tie around your neck to see how it overlaps. Remember, for Velcro to work you need one side to be the little, fuzzy loops and one side to be the prickly hooks. 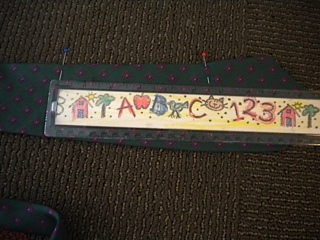 Also, you need one of these to be on the “wrong” or inside of the neck strap and the other to be on the “right” or outside of the neck strap so that when they overlap they can actually Velcro together. This is how your shoes worked back in the second grade. BAM. You just learned something. But back to crafting. Sew the respective parts of the Velcro to the ends of the neck strap. 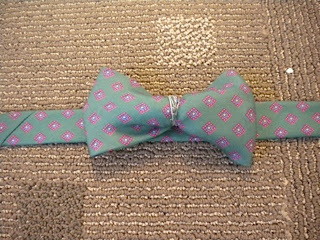 You may not be as excited as I was when I knotted that last stitch, but you are now a proud owner of a one-of-a-kind bow tie. I am dying of excitement. Thank goodness this isn’t a video column or else this would be really embarrassing. As always, happy crafting, and go Tigers (great win against #5 Florida)!